This entry was posted in Racing on February 26, 2012 by Steve Tilford. Yesterday went okay, considering. I didn’t have very high expectations. I wasn’t the least bit nervous for the race, which means I was probably not going to do very well. It is hard starting a race when you know if you do about everything perfect, you still have virtually no chance of winning. That doesn’t mean I only enter races to win, but there are certain events where if I raced the whole thing over and over 100 times, I wouldn’t win. This was one of those. 5 days ago I wouldn’t have written that, but I’m in a completely different state physically than I was 5 days ago. The race was pretty good, other than starting when it was nearly dark. The guys down here always do a very good job of getting the race right. It was pretty cool at the start, around 40. Less than 50 guys started the race since it was a PRO-1 race only. The strange part of the day was that it was calm. The wind usually blows like crazy at this race and that was not the case. I really don’t have any great stories from the race. It was just a normal bike race. The Elbowz Team won the race, which was virtually a guarantee. 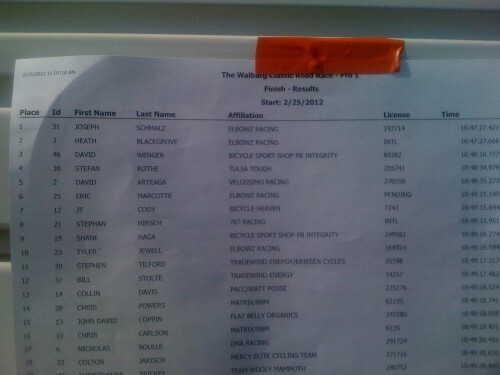 My old team mate and friend, Joseph Schmalz won the race, which is great. 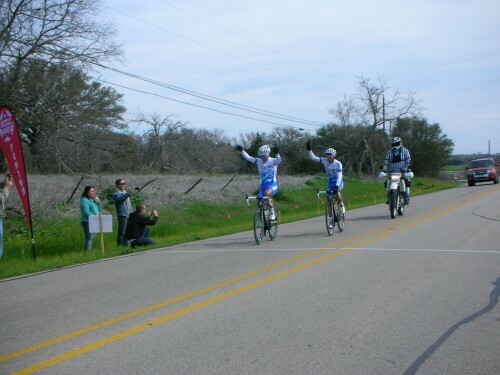 Riders from Kansas have won this race most of the times I’ve done it. Usually guys riding with me, but Joseph is the next best thing. His team mate, Heath Blackgrove, from New Zealand, was 2nd, finishing with Joseph. Squadra guys got 3rd with David Wenger, National Criterium Champion, and 4th was Tulsa Tough’s Stefan Rothe, all around honch, getting schooled a little by the Elbowz guys, but schooling the rest of us. They got away pretty early in the 1st lap and we never saw them again. 5 riders were away and the sprint was for 6th. 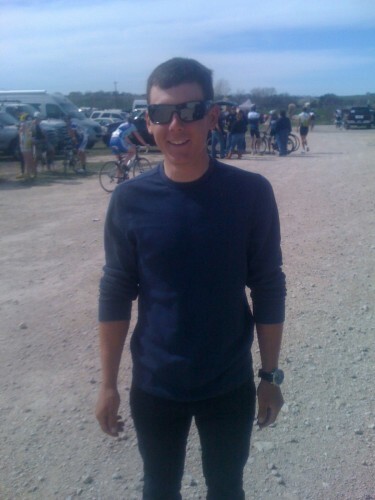 Eric Marcotte, Elbowz, won the field sprint. I was 6th, messing it up big time. It was up a pretty good grade and the field pretty much explodes the last 500 meters. So, I finished 11th, Bill finished 12th, right on my wheel. I went out for another ride late afternoon after the KU-Missouri game. I doubt many reading this watched that, but it was a very good college basketball game. 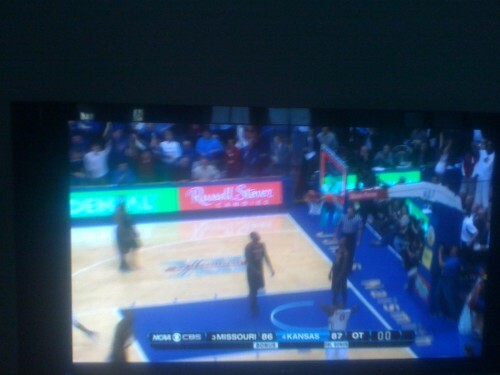 KU was behind by 19 points in the 2nd half and won by 1 point in overtime. Pretty thrilling finish. Today we race at noon at Pace Bend Park, southwest of Austin. I’ve won the race before and finished on the podium a few times. The course is around 6 miles and rolls. A pretty difficult course, but not super extreme. I’m looking to just get another race under my belt and ride hard. I could have felt worse yesterday, so I am okay motivated for today. The cedar allergies are pretty bad here and it seems my body doesn’t like them much, so just another bother. But, that is all it is, a bother. I can’t complain too much about racing my bike in the upper 60’s in February. Joseph and Heath crossing the line together. Joseph, up close and personal. The awards table Texas style. Results. Click twice to enlarge. 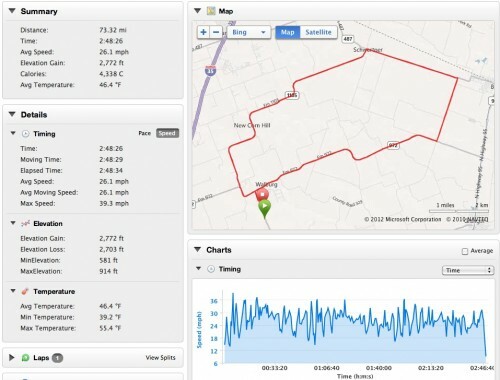 Garmin data from the race. Click twice to enlarge. KU by 1 when the clock expires. 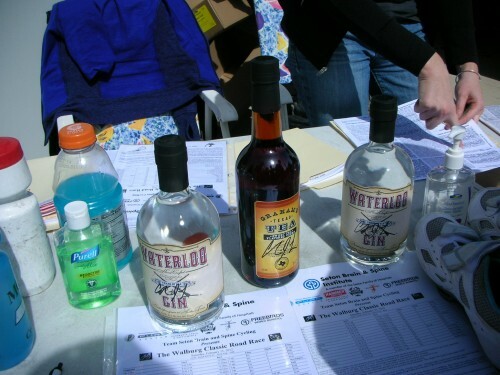 What place took home the hand sanitizer? Hi Steve, i thought you were of the opinion that team tactics were not that important. I’m curious as to why you think this would be different from e.g. the pro races you also mention as teams not having an effect.